Whenever I’m in the middle of a lot of projects, things start piling up. I’m not even going to show you the worst- the padded envelopes lurking at every corner, the bits of yarn labels here there and everywhere… Let’s start with something that might seem harmless and cozy. 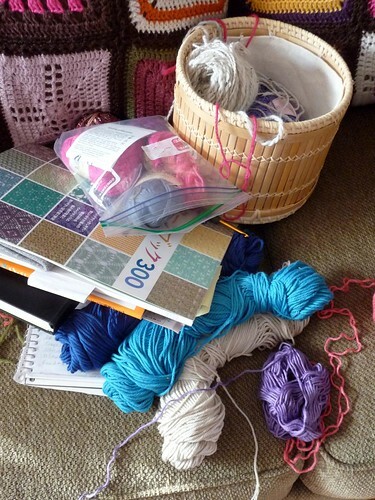 When I see that submission deadlines are approaching, I get a bunch of different yarns together and start swatching. No, you see, I get A BUNCH of different yarns together. I feel the need to pull out all of my yarn bits. I have them roughly organized by weight and fiber, but sometimes one skein ends up in another box or I’ll put two types together just to have an extra color…if I had more room I’d get a nice bookshelf for yarn, but it’d probably still end up all over the place. 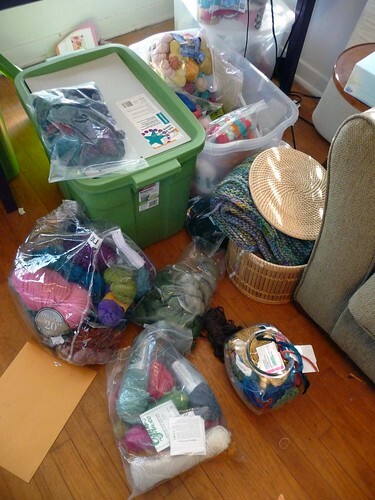 That’s not all of the yarn, although I do try to limit it to four 18 gallon bins. And a few…ok maybe 4 baskets. 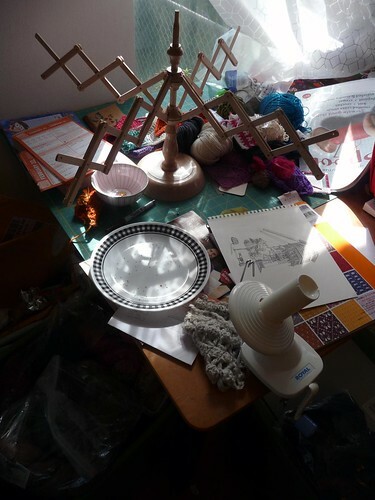 Plus the shelves with my fabric and whatever lands on the tabletop…. geez. What’s that? You want to see where I wind it? In an effort to always be ready, I keep my winder and swift set up (unless I’m sewing). I love that the swift doesn’t need to clamp to anything because then I can move it away from the nearest junk pile in order to wind. How many dishes can you spot in this photo? To be fair, I just finished eating the bagel that was on that plate, but still, gross–and what is that snack bowl doing there? I’ve been known to crochet yarn right off of the swift, if the project is small and I’m too lazy to clean up the winding area! WIP blurred for it’s own safety. When my brother and I used to do laundry together in New York, sometimes we’d go late and the attendant would keep repeating “No time to fold! No time to fold!” to let us know that once our loads were done, we were out. It became a joke between us, and we’d chant it sometimes. 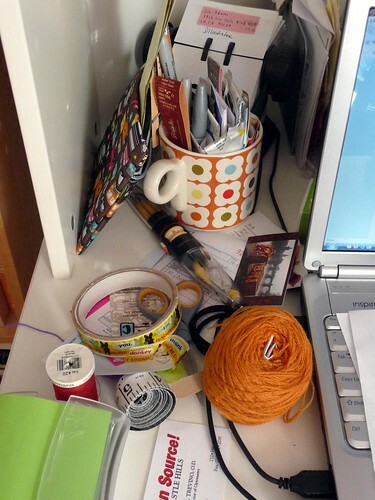 That’s kind of what happens in my head–no time to clean! Must crochet! Must submit! Must block! Must not miss opportunities! But if I’m logical and realistic, I know that taking the hour or two to put stuff away will free that nagging voice in the back of my mind. Maybe I’ll start tomorrow. Cause it’s kind of hard to type with all of this crap on my desk. Loved this post, I could totally relate. 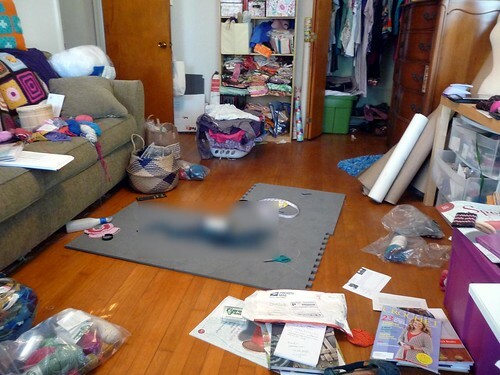 One time I pulled out everything and swatched so madly for a proposal deadline over 3 days that I was shocked when I finally stepped back for a moment and saw the deluxe mess. I actually had to photograph it LOL. Deluxe mess...I'm stealing that! It's since been cleaned and re-messed. Why do I even bother? This is hilarious. It is weird to see the room that way! Amy P.
but it only gets worse if you don't fold it right away...ask me how i know?